The golden retriever and his dad, Rich Powers, go wherever they’re most needed. Spencer visits schools, hospitals and senior centers spreading joy — and, most notably, the Boston Marathon to cheer on the runners. A video of Spencer sitting on a crate, holding two flags with the words “Boston Strong,” went viral during last year’s race with nearly 3 million views on Facebook. Spencer donned a bright yellow raincoat of his own when clouds filled the sky, to help keep him dry and stand out in the crowd. Stationed near mile marker two, the encouraging pup held two Boston Strong flags in his mouth and seemed perfectly content to cheer on the athletes, rain or shine. He was a welcome presence as runners began the 26.2-mile course. He was frantic to be by his human’s side. 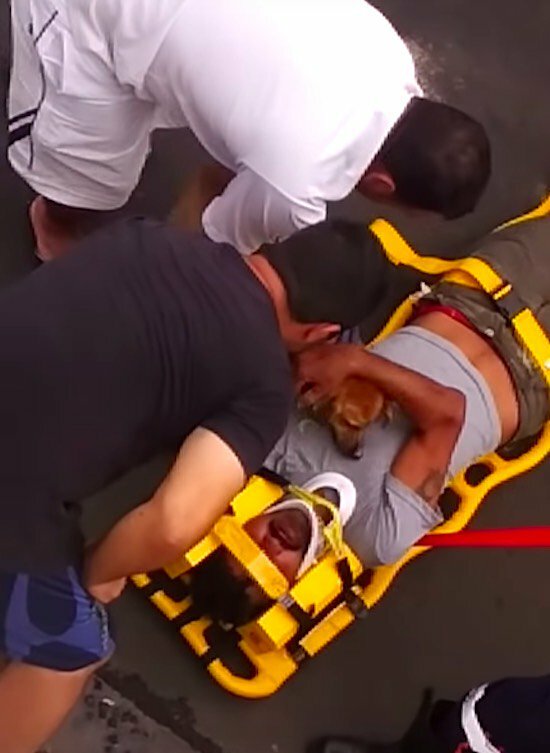 A tiny dog was filmed displaying concern for his human after the man fell and seriously hurt himself. 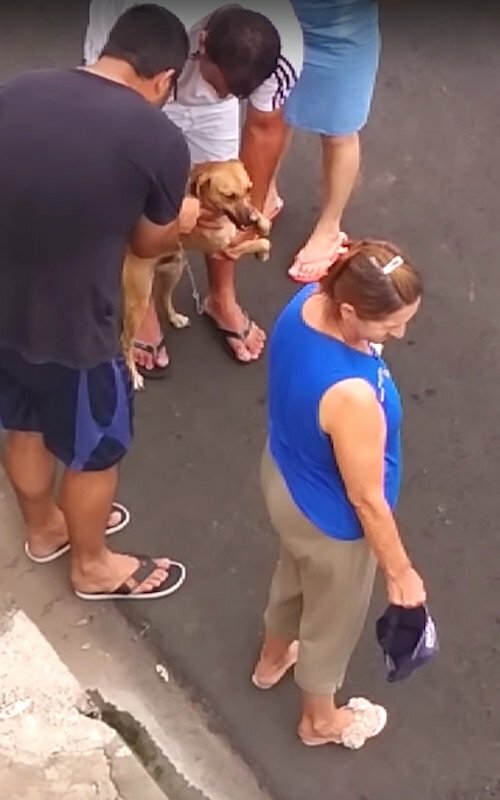 Filmed in Ipeúna, São Paulo, Brazil by a bystander, the dog is seen being held by a group of people (possibly neighbors or friends), who are comforting him as he barks. But at 1.05 minutes he breaks free and runs over to his human and leans on his chest. He is visibly protecting the man, who holds his dog in his arms to comfort him. 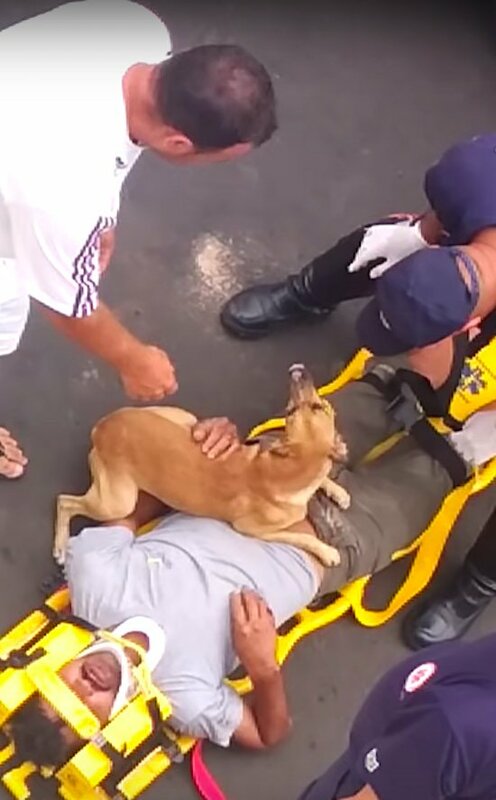 His friend ends up covering the dog’s eyes with a baseball cap so that he doesn’t interfere with the paramedics loading the man onto a stretcher. It’s so touching to see the dog’s emotion and care for his dad. We’re hoping the man and the dog are reunited soon.